William Shatner lent his support to Nova Scotia's film industry on Wednesday, as thousands of people protested planned cuts to a tax credit outside of Province House in downtown Halifax. The Canadian actor's tweet to Premier Stephen McNeil and Finance Minister Diana Whalen has been retweeted almost 1,000 times and favourited nearly 700 times. Actor Cathy Jones took to the stage — made specifically for the protest — on Granville Street. She said she's lived and worked in the province for 20 years, performing in CODCO and This Hour Has 22 Minutes. Jones praised the industry for telling Nova Scotia's stories. "It's a lot of people working quietly and working diligently and keeping our culture alive," she told the crowd. "What do they think they're doing destroying that?" Jones hopes the big turnout will convince the Liberal government to change course. "This film industry is massive and beautiful and to mess with it is a major mistake," she said. Actor Jonathan Torrens, who co-hosted Street Cents and has starred as the character J-Roc on the Trailer Park Boys, also spoke and called on the Liberal government to change course. 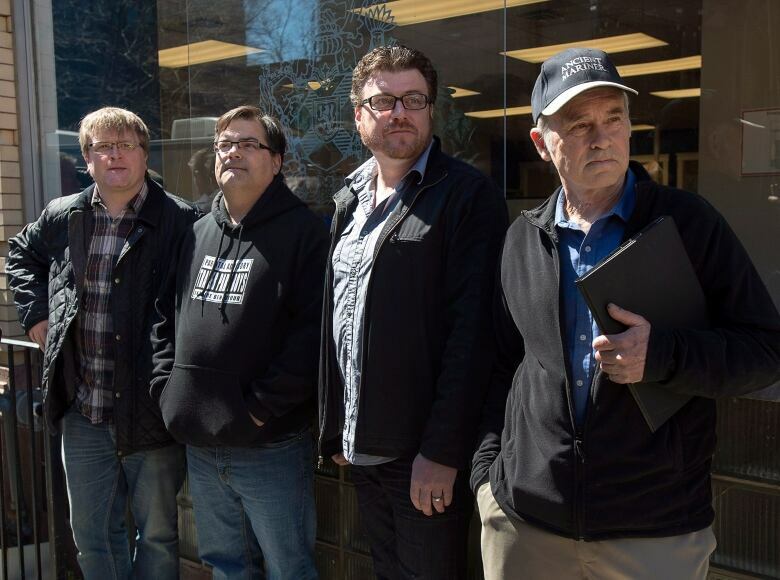 "Rumours are that there are close to 5,000 people here — film industry professionals, local business owners and local citizens who just know this is not the course of action," he said. "Let's be very clear folks. The moment this was announced last Thursday, there was an instant and devastating impact from this suggested course of action." The rally was put on by Screen Nova Scotia, the industry's advocacy group. A large crew set up a stage and several Jumbotrons early this morning. The crowd protested the proposed cuts to the film tax credit. In last week's spring budget, the province announced it was slashing the credit from 100 per cent refundable to 25 per cent refundable. "The pain from this decision will be felt from Louisbourg to Lunenburg, from Halifax to Hammonds Plains. This is not a big city issue. This is not a Hollywood issue. Not even a Hali-wood issue; it's a province-wide issue," Torrens said. Whalen met with members of the film industry Tuesday for the first time since the cuts were announced. Marc Almon, with Screen Nova Scotia, thought the meeting was productive. "They have agreed what they put forward is not workable," he told reporters Tuesday. Whalen took away a different message from the meeting. "What I was acknowledging is they have a problem with this — we do not. It works for government," she said. At issue is a tax credit that is really a subsidy worth up to 65 percent of salaries on the film set. Prominent businessman John Risely finds it laughable people are defending such a generous allowance. "We're paying 65 percent of people's wages. The taxpayer is paying 65 percent of people's wages. And people thinks that's ok? It's nuts, it's crazy," he said. Premier Stephen McNeil doesn't think the success of the industry rests on what he calls the richest film tax credit in the country.He said the credit was previously increased from 50 to 65 per cent, but Nova Scotia's share of the country's film work dropped from 2.8 per cent to 2 per cent over that period. "As that tax credit has been going up our percentage of the business in Canada is going down. That's a sign that the incentive is not what's driving this," he said. McNeil said the credit is effectively a grant, and that didn't make sense for a province with a struggling economy. "It's simply something the taxpayers of Nova Scotia can't afford," he said. He invited industry members to present a better solution that fit the "fiscal envelope." "We can't afford to subsidize every job in Nova Scotia at 50 to 64 per cent of the labour cost," he said.